Sitting at a desk for hours on end can damage your posture as well as your digestive system, among other harmful bodily effects. Read on to find out how to improve office wellness. Sitting at a desk for eight hours or more a day can be detrimental to your health. A sore back and neck, painful wrists, bad posture, blurry eyes and lack of energy are all among the problems that can result from sitting for too much of the day. As well as being physically uncomfortable, these ailments can lower your productivity – and they may become worse over time, even resulting in long-term or permanent injuries. Following five simple steps can combat the negative health effects of working in an office and generally contribute to better office wellness. Typing, using a computer mouse and writing - these three activities can all lead to repetitive strain injuries, such as carpal tunnel syndrome. To combat this type of problem, you can use a wrist pad to prevent you from over-extending and over-flexing your wrists. Always remember to keep your wrists flat and straight. Raising them or putting them at angles adds extra strain. Also, whenever you’re away from your desk, move your wrists – and exercise them regularly to keep them as strong as possible. In an office environment, the right chair can make all the difference. An ergonomically designed chair with proper back support helps ensure that you maintain the correct posture and protects your spine. High-quality office chairs feature fully adjustable height, tilt, tension and armrests and superior support for the lower back. This type of chair really is worth the investment – it protects your health and, by ensuring that you’re comfortable, helps you work as productively as possible. In an office environment, bad posture, which puts strain on the back, neck and shoulders, is often a result of having your desk, chair and computer at the wrong heights. You should ensure that your monitor is raised to eye level so that you don't have to raise or lower your neck to see it properly. 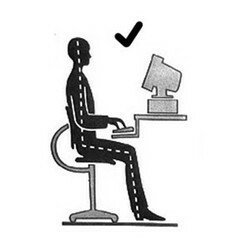 Also ensure that your monitor is directly in front of you, in the middle of your desk. This will stop you from twisting your body and neck. Finally, ensure that your feet are flat on the ground and that your knees are only slightly lower than your hips. A poor diet can make you feel sluggish, preventing you from focusing properly on your work. Over time, it can also contribute to a range of health problems. To stay healthy, snack on foods like low-GI bread, nuts, salads and fruits. These will give you the necessary energy. Also make sure you drink enough to stay well hydrated. Although you may feel you rely on coffee, try to switch to drinking more water – the caffeine will eventually wear off, contributing to a loss in concentration and a drop in productivity. Last but not least, get moving whenever you can. An active, healthy body leads to a sharp mind. Exercise can help offset the stress that sitting in front of a desk all day puts on your body and mind, as well as strengthening your back, wrists and neck for future days at the office. Walking around the block or going to the gym on a regular basis will help. Also aim to exercise while you’re at work. For example, a quick break to walk up and down the stairs or a stretching session in the parking lot will leave you feeling healthier and more alert so that you can focus on your work. I've never used wrist pads. I'll go look at some at the electronics store. Nice article!